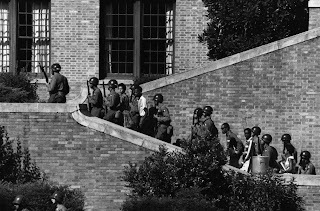 Staring straight ahead the youngsters formed a single file and, surrounded by some of America's best soldiers carrying rifles with bayonets fixed, they marched through a jeering crowd into the school to begin the fall term after two previous failed attempts. As the nation and much of the world watched, Central High School became desegregated. The 14th amendment to the United States Constitution, which mandates that no American will be deprived of the equal protection of the laws, had been upheld. I'm proud to have been born on this historic day.